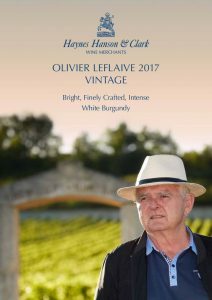 2017 is a huge success for Olivier Leflaive white burgundies. The wines are sapid, intensely flavoured, with enough richness (but not too much) and lively, bright acidity. Levels of alcohol are relatively low and we found a superb purity to the fruit in these wines. These wines are precise and full of verve and life. At their best, there are elements of 2014 to be found here. It is thanks to the extraordinary talent of Franck Grux, and the back-up from his strong, long-standing team, that the Olivier Leflaive wines are so exciting. Franck’s attention to detail, his obsession with picking dates, his ability to identify and eliminate less-than-perfect barrels from a cuvée, his understanding of the need for freshness and purity, mean that he produces wines of beauty, elegance and real character. Bravo Franck! This is an early moment to buy wines that are still in barrel, but we are rewarded by being able to select the top cuvées, and by securing favourable prices. In turn, we offer you the opportunity to reap these same benefits. The wines are offered in bond, excluding duty and VAT, which are payable on shipment later this year for some wines, or early in 2019. Following a mild start to April, which saw buds appear, the spectre of frosts once again appeared. The nights of 27th, 28th and 29th April saw growers from many villages out in the early hours, burning straw, to create clouds of smoke to combat the danger of the clear, cold skies above. Unlike much of France, almost all the Côte d’Or miraculously dodged the frost bullet and normality resumed. A sunny May led to perfect conditions for flowering at the beginning of June. Summer continued in this vein, the odd burst of rainfall in July helping the vines to mature the berries, bringing on an early harvest. Picking at Olivier Leflaive started on 30th August in ideal conditions. The grapes were incredibly healthy and perfectly ripe, with, thankfully, correct yields.